Summertime is an extremely comfortable 16.7m traditional timber vessel with a professional crew of two to look after its guests. A recently refurbished interior including great saloon & entertainment area, private twin and share cabins, airconditioning and TV/video make living aboard an absolute pleasure for up to 14 guests. On deck you have plenty of space for sunbaking and relaxing while viewing the beautiful sights of the Whitsunday’s and to top it all off a fresh water hot tub/spa on the rear deck. Try Sea Kayaking Sea Kayaking, Sailing and Scuba Diving will provide an action packed adventure. Summertime is a classic timber square rigged vessel with all modern comforts – the perfect way to enter another world of freedom. Enjoy the ambience of traditional sailing in ultimate comfort as Summertime plys the sparkling waters of the beautiful Whitsundays. Handcrafted in 1947 by master shipwrights, Summertime has a rich history and has been lovingly restored and immaculately maintained in the ultimate sailing comfort. While retaining all of her old world charm, the boat also boasts an onboard freshwater hot Jacuzzi, hi tech DVD/PC entertainment system, full air conditioning throughout, luxurious berths and nine of the latest inflatable two person kayaks. Enjoy the Voyage After you are welcomed aboard by our friendly crew, the lines are thrown away and you’re underway. As the sails are raised you settle in on the teak decks for the ride. Our crew take this opportunity to guide you through some safety and snorkelling briefs as you leave the bustling mainland behind… and the magic of sailing begins to set in with the gentle lap of the ocean against the hull and a frothy trail in your wake. Discovering the wonders below the water is also easy aboard Summertime. The Whitsunday islands can definitely be a divers and snorkelers paradise and your onboard Dive Instructor will make your SCUBA experience below the water unforgettable. The opportunities are almost endless in the Whitsundays and we carry a full complement of dive gear aboard. Our local area of the Great Barrier Reef Marine Park is rated among the best in the world with over 100 chartered dive sites, many with National Park mooring buoys. We can show you huge coral bommies, vertical coral walls, stunning swim throughs, massive coral structures with huge overhangs, even secret caverns and the most amazing fish life. You may swim with turtles, huge gropers and play with schools of tropical fish and you will be amazed by the bright and vivid colours. With its warm water, calm seas, and easy beach entries the Australian Whitsunday Islands are the perfect place for the novice diver to be introduced to the wonderful world of SCUBA. In the Whitsunday Islands, where year-round the water temperature stays close to 25 C, diving is rarely deeper than 80 feet and most dives are at between 30 and 60 feet. Visibility is mostly good to excellent. 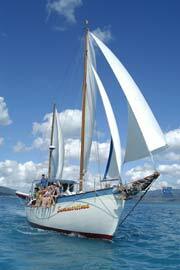 Combine a great sailing adventure with snorkeling and diving in one of the world’s most spectacular cruising grounds. For the experienced diver Summertime offers a sensational platform to explore from. Onboard tank fillers mean air fills are unlimited and you are quite welcome to dive straight from the back of the vessel. For the novice or rusty diver we happy to supply dive guides at no added cost, these highly trained instructors can also point out the features and highlights to be found at each new dive site. This is our paradise we would like to share it with you… Memories in the Making Whether enjoying the thrill of sailing, exploring by kayak or venturing below, our crew’s intimate local knowledge means you are always shown the best of the Whitsundays in the best ways possible. And our hi tech Canon 10 meg camera is always at hand to capture your Summertime adventures forever – and with underwater housing, your diving and snorkeling forays are also forever remembered! Exploring the Whitsundays Summertime style allows a wide array of destinations to be leisurely enjoyed both above and below the Whitsundays sparkling waters. Our crew possess an intimate knowledge of the area gained over years of exploration and this wealth of knowledge is yours to share as they guide you through your Summertime voyage of discovery. Paddle peacefully by kayak into the far reaches of prehistoric Gulnare Inlet or magnificent Cid Harbour on Whitsunday Island. Skim effortlessly over the pristine sand sweeps of magnificent Hill Inlet or land on a tiny isolated sand spit between craggy cliffs on Hayman Island. Enjoy superb eco walks that will literally leave your senses awestruck and your spirit inspired. Sawmill Beach to Dugong Bay, Whitehaven Lookout, Nara Inlet … these bushwalks offer a unique and breathtaking glimpse into the bio diversity and ageless beauty of this drowned mountain range. Dive and snorkel some of the worlds most renowned coral gardens and get close to some of their amazing inhabitants … Blue Pearl Bay, Manta Ray Bay, Langford Reef and Cateran Bay are just a few of the pristine dive locations where you can meet with giant maori wrasse, lionfish and turtles or peruse underwater gardens unlike anything you’ve ever seen. Sailing Summertime in the Whitsundays is a tropical adventure that takes you to a myriad of glorious locations in absolute comfort and old world style. On your visit to Whitehaven Beach – you will soon see why it is rated one of the best beaches in the world! It’s a very inviting scene and you’re soon down on the beach squelching your toes in the super fine silica sand and marveling how it isn’t hot on your feet. Some indulge in a game of beach cricket or a spot of kite flying, others relax with a swim or a sunbake or you can choose a long stroll along the beach to take in the amazing views. All kinds of marine life can be spotted in the shallows and the odd dip to cool off is pure bliss. Fabulous Food Sailing and exploring the Whitsundays creates quite an appetite and luckily delicious meals are our trademark! Summertime’s menu is renowned worldwide and our crew will continually surprise you with their delectable creations. Our friendly and enthusiastic crew arrange freshly prepared local foods throughout your journey – all prepared onboard to retain freshness and crispness. Special diets and special occasions can be catered for. Day 1 Morning Tea: Tea & Coffee with an assortment of cakes. Lunch: An assortment of fresh breads, meats, salads, fruits and condiments for you to make your own creation. Afternoon tea: Tea and Coffee served with lamingtons (A traditional Australia Sweet), soft vanilla sponge cake coated in a light chocolate topping then sprinkled with shaved coconut. Sunset Snacks: A selection of oven baked snacks and dipping sauces. Dinner: Tender chicken thigh fillets, marinated in succulent honey mustard and mixed herbs, served with a fresh cherry tomato, fetta cheese, green olives stuffed with sun-dried tomatoes and spanish onion salad. Fresh green beans steamed and lightly tossed through garlic butter with oven roasted potatoes seasoned with fresh herbs and cracked pepper. Warm herb and Parmesan bread. Dessert: Chocolate cake with a rich topping covered in creamy custard. Day 2 Breakfast: A fresh tropical fruit salad, served with yoghurt. Warm raisin toast, fruit loaf, white and wholemeal bread. With a wide range of condiments, cereals and milk. Tea, coffee and juice. Morning Tea: Tea and coffee served with assortment of cakes and biscuits. Lunch: Thick soft focacia bread topped with grilled chicken, tabouli, sun dried tomatoes, avocado, onion and cheese lightly baked, served with a fresh caeser salad and a creamy tuna and asparagus pasta with a small platter of fresh fruit. Afternoon Tea: Tea and coffee served with a chocolate and cream sponge roll. Sunset Snacks: A large platter with cheese, carrot and celery sticks, kabana, pickled onions, crackers, corn chips and a selection of dips. Dinner: Tender scotch fillet steaks in a secret marinade. Served with a delicious tomato, onion, garlic and mushroom pasta bake. Broccoli and cauliflower in a cheese sauce, served with a fresh garden salad and sun dried tomato pesto bread. Dessert: Chocolate and caramel slice, made fresh on the boat from our own recipe. Morning Tea: Tea and coffee served with fruitcake and biscuits. Lunch: BBQ Sausages, coleslaw, creamy potato salad and a fresh green salad. Now that we’ve made your mouth water, we’d like to make you picture a typical evening onboard Summertime in the beautiful Whitsundays. Taking in the sunset with a cold drink on deck is a must and after desert you can watch a movie in air conditioned comfort… or another have another Jacuzzi… heaven. And there is the entertainment of our slide shows each night in the saloon – all of the days dive photos… picture postcard stuff and there’s always some action heroes for a good laugh. Talking about laughs… there are also some secret Summertime games that will have you bending like never before!?? Relax in the Hot Tub A Summertime voyage is a full three day, two night Whitsunday adventure discovering another world of pure wonder in classic style and superb comfort. The ever changing 360 degree views of paradise, spacious decks where you can choose shade or sun, our friendly skipper to chat to and teach you a few things in the wheelhouse, a spacious and comfy saloon and luxurious berths to enjoy a brilliant sleep as the ocean laps the wooden hulls while Summertime bubs gently at anchor – these are all things you can look forward to. The delicious meals from our renowned menu, kayaking adventures and the onboard hot tub will make relaxing a dream and sailing back to Airlie Beach you will feel as if you’ve been at sea far longer than three days. Our guests return tanned, content and full of wonder at all they’ve experienced. Your Summertime voyage in the Whitsundays will be your best holiday ever and as Jacques Cousteau says, your eyes can truly be “Opened by the Sea”. This ambience must be experienced for yourself – you’re in for a real treat…!